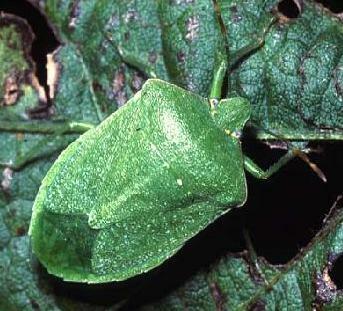 Region: This stink bug can be found in the southwestern United States. Life cycle: This insect produces four to five generations each year. The adult stink bug hibernates in garden rubbish. Physical Description: This 1/2 inch long bug is light green with speckles. The hibernating form might be a pinkish color. The eggs are laid with a sticky substance to the leaves of host plants. The nymph is a bluish gray with red marks and is round in shape. Feeding characteristics: This pest is found on bean, citrus, peach, pecan, potato, and tomato plants. They feed on the leaves and fruit; cause the pods to drop prematurely and nuts to develop black pits. They do this by sucking sap from the leaves and fruit. Controls: Controls are not usually necessary, but if damage is intolerable, dust with sabadilla.